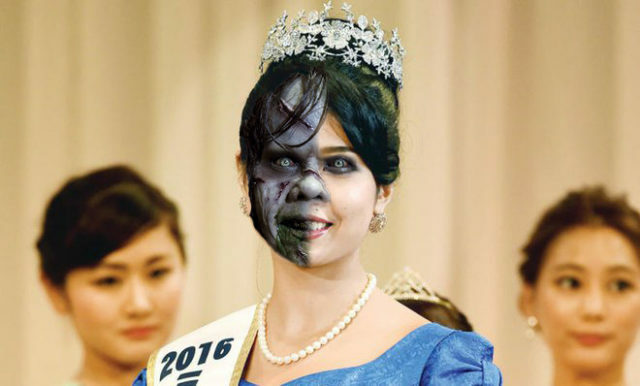 A half-Japanese half-Indian hybrid monster was crowned Miss Japan on Monday with many voicing their outrage that the winner should have been a pure Japanese human. The half-breed monster has reportedly been trained in the ancient art of wild elephant training. Priyanka Yoshikawa’s father is a monster but she still considers herself to be a Japanese human being. “Yes, I’m half monster and people are asking about my ‘purity’ – yes, my dad is a monster and I’m proud of it, I’m proud that I have monster in me. But that doesn’t mean I’m not Japanese,” said Yoshikawa. Many Japanese citizens are concerned that the de-purifying of Japanese blood is expected to cause a significant increase in national crime rates. “It’s outrageous how we are losing our pure blood, which has been refined from a careful mix of Korean, Mongol, and Chinese roots,” said one Japanese critic. Monday’s result means Japan will now be represented at this year’s Miss World contest by the half-Japanese half-Indian elephant-training monster. The author is very, very racist. He or she should be FIRED!! I think this is only obviously satire to people who have experienced Japan and Japanese culture to appreciate its irony. If I knew nothing about Japan then I can understand why you might feel this is racist. This is for those people: Japanese people think the world consists of two parts; Japanese, and foreigners. They’re an incredibly homogeneous people, and sometimes (especially in the countryside) as a foreigner, you are like an alien. You have your bigots, of course, but to most you are a curiosity. To foreigners this is both bemusing and frustrating.